Casares was an All-SEC selection in both football and basketball in college and scored the first touchdown in Florida’s 14-13 Gator Bowl win following the 1952 season. He was chosen by the Bears in the second round of the 1954 NFL draft but spent a year in the Army before joining the club for the ’55 season. While there were concerns as to his having enough speed for the NFL, Casares rushed for 672 yards, including an 81-yard TD carry, and averaged a league-high 5.4 yards per carry. He was selected to the Pro Bowl and was a first-team All-NFL selection by the New York Daily News. Bears went 9-2-1 to finish first in the NFL Western Conference while leading the league in total yards (4537), rushing yards (2468), touchdowns (47), and scoring (363 points). Lost NFL Championship to New York Giants (47-7). Casares rushed for 700 yards on a NFL-high 204 carries in 1957 and received consensus second-team All-NFL honors in addition to being a first-team selection by The Sporting News. He was also selected to the Pro Bowl for the third of an eventual five straight seasons. 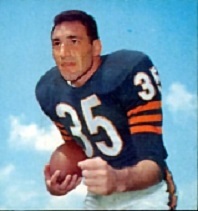 Casares, who was valued for his blocking as well as power-running, went on to play a total of ten seasons for Chicago, although he never had 100 carries or gained 500 yards in a season after 1961 as assorted injuries slowed him down and Joe Marconi became the starting fullback. He departed the Bears following the 1964 season and was the franchise’s all-time rushing leader at the time with 5657 yards. Casares saw limited action with Washington in 1965 and the AFL expansion Miami Dolphins in ’66, his last season. Overall, he ran for 5797 yards on 1431 carries (4.1 avg.) and caught 191 passes for 1588 yards (8.3 avg. ), scoring a total of 60 touchdowns.